The Belgian striker celebrating one of his two goals last night. 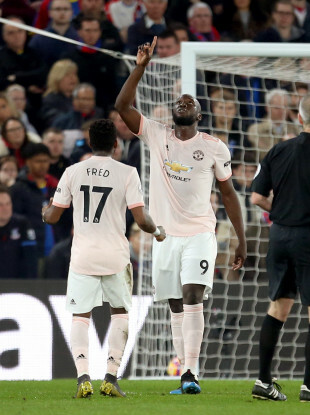 ROMELU LUKAKU WAS “hoping for a chance to play as a centre forward” for Manchester United and believes his two-goal showing against Crystal Palace helped him and the Red Devils to silence more of their doubters. The resurgence being enjoyed under Ole Gunnar Solskjaer continued for the Old Trafford outfit on Wednesday as they secured a 3-1 victory away at Selhurst Park. Belgium international Lukaku helped to put them on course for three points in south London with a pair of well-taken efforts either side of half-time. The 25-year-old was used in his favoured position against the Eagles, with Marcus Rashford – who has thrived since being moved into a striking role – left out of the starting XI due to injury concerns. Lukaku made the most of his chance, telling MUTV afterwards: “I was just hoping for a chance to play as a centre forward and I got the chance today and I’m really happy that I helped the team win the game. It was the 25-year-old’s 111th goal of his career in the English top-flight — meaning he is now joint-20th in the Premier League’s all-time top scorers list with Dion Dublin. Victory over Palace stretched United’s unbeaten run in Premier League competition under Solskjaer to 11 games and saw them secure an eighth successive win on the road. “It was a really good achievement if you look at the teams we played against,” Lukaku added. Solskjaer was pleased with his performance, saying: ”Lukaku had two good goals and his link up play was very good too. “He is working hard in training and has been playing well. He’s had to play wide for me and had many defensive duties, so I’m happy for him playing as a number nine. With Arsenal also emerging victorious in midweek action, United’s latest triumph was not enough to lift them back into the top four. They are, however, just one point behind the Gunners and are aware of the need to maintain the momentum that has been established since Jose Mourinho was replaced by Solskjaer in December. United will be back in action on Saturday when they play host to Southampton. Email “Lukaku takes chance at centre forward to enter Premier League's top 20 all-time goalscorers”. Feedback on “Lukaku takes chance at centre forward to enter Premier League's top 20 all-time goalscorers”.